The cardiovascular system of the upper torso includes the heart and most of the major blood vessels of the circulatory system. These vital structures are critical to the process of pumping deoxygenated blood to the lungs for gas exchange as well as pumping oxygenated blood to the body’s tissues to support their metabolic functions. The heart is the body’s circulatory pump that is responsible for the movement of blood throughout the entire body. The heart acts as a double pump by pushing both deoxygenated blood to the lungs and oxygenated blood to the body’s tissues with each heartbeat. The heart is mostly made of cardiac muscle tissue, which requires its own constant supply of oxygenated blood. The left and right coronary arteries provide this blood supply to feed the heart’s own energy demands. Small blockages in the coronary arteries lead to chest pain called angina pectoris; complete blockages of the coronary arteries lead to myocardial infarctions, better known as heart attacks. The pulmonary arteries and pulmonary veins provide vital but short distance blood flow between the heart and the lungs. Exiting the heart from the right ventricle, deoxygenated blood flows into the large pulmonary trunk before splitting at the left and right pulmonary arteries. The pulmonary arteries carry blood to smaller arterioles and on to the vast capillary beds of the lungs where carbon dioxide is released and oxygen is obtained from the air in the alveoli of the lungs. These capillaries converge into larger venules, which further converge to form the left and right pulmonary veins. Each pulmonary vein carries blood from a lung back to the heart where it reenters through the left atrium. Oxygenated blood exits the left ventricle of the heart and enters the aorta, the largest artery in the human body. The ascending aorta extends superiorly from the heart before making a 180-degree turn to the left in a portion called the arch of the aorta. From there it passes posterior to the heart as the thoracic aorta on its way toward the abdomen. The aorta branches as it passes through the thorax, branching off into several major arteries as well as many minor ones. - The left and right coronary arteries branch off from the ascending aorta, supplying the heart with its vital blood supply. - The arch of the aorta branches off into three major arteries – the brachiocephalic trunk, left common carotid artery, and left subclavian artery. These arteries collectively supply the head and arms with oxygenated blood. - The thoracic aorta continues to branch into many tiny arteries that supply blood to the organs, muscles, and skin of the thorax before entering the abdomen as the abdominal aorta. 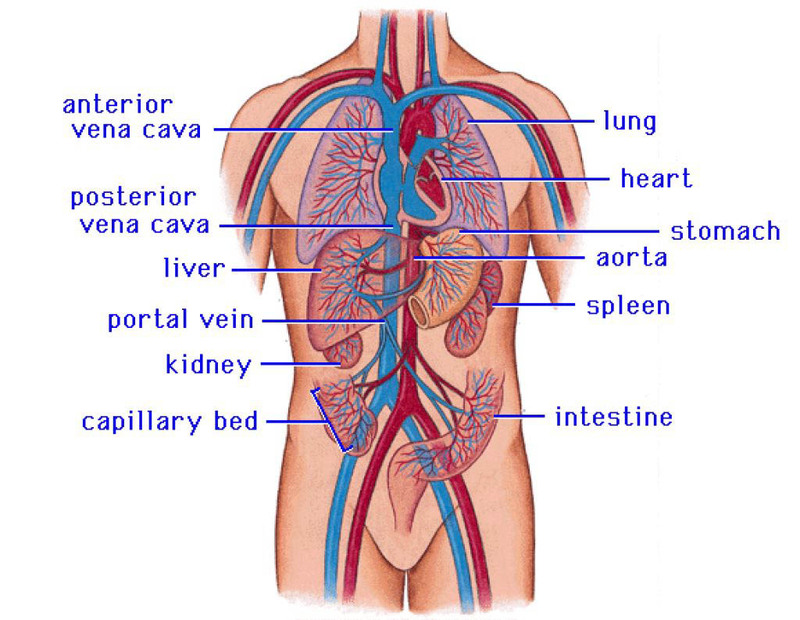 - Blood from the abdominal aorta supplies oxygen and nutrients to the vital organs of the abdomen through arteries such as the celiac trunk and common hepatic arteries. Functioning at the end of the circulatory cycle, the veins of the upper torso carry deoxygenated blood from the tissues of the body back to the heart to be pumped through the body again. Blood returning to the heart from the lower torso and legs enters the upper torso in a large vein called the inferior vena cava. 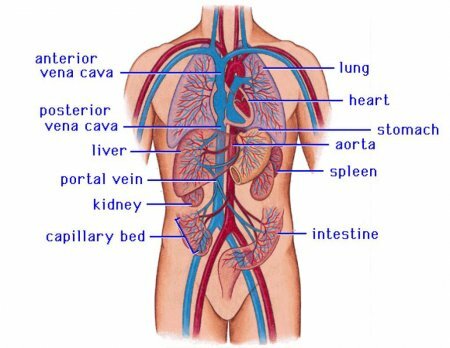 The inferior vena cava picks up deoxygenated blood from the hepatic and phrenic veins before entering the right atrium of the heart. Blood returning from the head enters the torso through the left and right jugular veins while blood returning from the arms enters through the left and right subclavian veins. The jugular and subclavian veins on each side merge to form the left and right brachiocephalic trunks, which go on to merge into the superior vena cava. Several smaller veins carrying blood from the organs, muscles, and skin of the upper torso also merge into the superior vena cava. The superior vena cava carries all of the blood from the arms and head into the right atrium of the heart.